Junior high and high school students from across Southeastern Utah gathered together in the BDAC on September 27th to participate in First Lady Mary Kaye Huntsman's "Power in You" Tour. College of Eastern Utah Ambassadors and ASCEU assisted in the event. The Power in You Tour is a motivational program reaching out to students who have been bullied in school, who think they are limited by physical limitations and to those students who can make a difference in one person's life. This program focused on the emotional aspect of life-challenges and at-risk behavior in order to bring hope to teens and encouraged them to fulfill their life and education potential. The inspiring speakers included Gov. 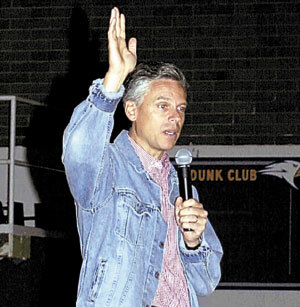 Jon Huntsman; Dan Clark, author of the Chicken Soup for the Soul series; and others who talked about overcoming challenges and struggles in life. First lady Huntsman had teen speakers involved in the program. Ambassadors from different schools in Utah came and shared some of their experiences that they had within their social lives. A foreign student said "My name is Nadia and some people label me a terrorist and that hurts me." Other students shared their stories of being made fun of, being called a dweeb or pushed around. Two particular speakers had physical disabilities. At six foot seven inches tall, one man dreamed of becoming a professional basketball player. His hopes for the future were shattered when he was electrocuted and his legs were totally destroyed. He remembered thinking, Please God, just let me die. Some people, if put in this situation, would just sit around and ponder about what terrible things had happened to them. This man, however, took this circumstance and turned it into one of the most memorable and admired experiences anyone could imagine. He set records using his wheelchair and hopes to compete the Paraolympics. Another woman who uses crutches to get around, competes in bobsledding, something others told her she could not do. Each of the speakers focused on one primary topic: don't let what you cannot do interfere with what you can do. The speakers let everyone know that each of them has potential that can be reached if they hold onto their dreams and never let anyone tell them they cannot do it. This tour inspired the students to motivate themselves and to help others. Students left the conference with an inspirational feeling knowing they can make a difference not only with others, but within themselves. The tour was continued at other universities and colleges throughout the state last week. Previous Is Sidney Crosby the Chosen One? alright. i don’t understand this. how can this say that it happened on september 27th when it’s only september 21st? Megan, genius. The article was printed in October 2005. It’s a year old!